"The Model 19 is 1938. It came in large lumps, as photos attached! It arrived without a tank, or handlebars, headlight, exhaust, etc. I acquired a Model 18 tank (the original would have had a panel in the top - see September 2012 posting). I found out a bit late that the oil pump was broken, but managed to find and fit one. The rest of the engine was OK and on the original bore. 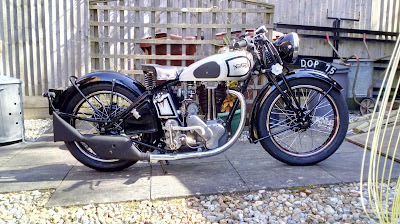 I have had new valves and guides fitted, and some work was required on the exhaust thread. I hand painted the mudguards etc, but the oil tank was sprayed by a local painter. The frame and forks were powder coated. If you look closely you can tell which bits I did, but I think it makes it look like an older restoration! I did not attempt to find one of the original 'cow's udder' silencers fitted to all 1938 models but have fitted the pattern Brooklands silencer given me by Simon Grigson, and which is much better looking. I did not have the correct clutch lever, and found that the modern replica levers do not give quite as much pull on the cable, making adjustment rather difficult. After several goes around my home circuit, which is a circular route of 2 miles, and always a flat or downhill journey home, I finally succeeded in getting the clutch to a functional state, and since then I have completed 2 runs of over 10 miles. It was a very pleasant ride indeed. The engine powers along like a turbine, and I was easily able to cruise at over 45 mph. The handling was lovely, perhaps enhanced by the Avons. I suspect higher cruising speeds are readily attainable, but this can wait until I have done 100 miles and changed the oil."